Sporting the charm of the Eastern Seaboard, this garage apartment plan displays classic Cape Cod styling with its simple facade, shuttered windows, steep roofline and dormer windows. An overhead garage door provides side-entry access to the 839 square foot garage/workshop. Extra deep bays are perfect for oversized vehicles such as trucks and SUVs. Furthermore, the fisherman in your family will easily recoganize this design as the perfect boat storage garage plan. Whether you need a place to store vehicles and other motorized items or a large workspace for your home workshop, this garage apartment plan delivers with its roomy main level. A storage area offers space for the laundry facilities accommodating those living on the upper level. Interior stairs lead the way to the second floor living quarters. With 688 square feet of finished living space, the second floor neatly separates the private spaces by situating the common areas in the center of the floor plan. The apartment delivers a combined living area and kitchenette. Two bedrooms flank the gathering spaces, each revealing a private bath and a walk-in closet. Don’t miss the dormers spilling natural light into each living space. Perfect for rental property, a guest retreat or even an alternative to a vacation home at the lake, this Cape Cod style garage apartment plan is worth taking a closer look. 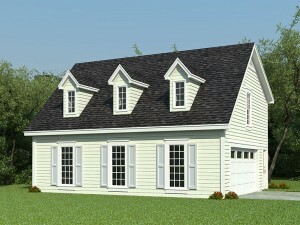 For more garage apartment plans like this one, visit The Garage Plan Shop.